2016 Document of the Month Archive - Le Comité des Archives de la Louisiane, Inc.
We were pleased to begin these page in April 2012 and have presented a variety of historical documents of interest to our members and visitors. This page is an archive of documents for the year 2016 in reverse chronological order. (12/1/16) In the early years of the Civil War, Louisiana parishes issued scrip to pay its debts. This month's document is a one-dollar note issued by the Parish of Washington on 6 December 1862. The payment was secured by taxes of the parish and was receivable for all dues to the parish when presented in sums of twenty dollars. This note was signed at Franklinton by S.W. Bickham, Parish Treasurer, and S. Ellis, Clerk of Court. The original document is found in the E. Russ Williams collection which is currently being processed by staff at the Louisiana State Archives. A description of this collection is planned for publication in the March 2017 issue of Le Raconteur. The image is provided courtesy of the Louisiana State Archives. (11/1/16) Cornetist Charles "Buddy" Bolden was the first practitioner of the style of music that came to be known as New Orleans jazz. Born in 1877, he was the son of Westmore Bolden and Alice Harris. He performed in New Orleans between 1895 and 1906. No recordings of his music are known to exist, but his contributions to jazz music were passed down through oral history of those who knew and played music with him. Bolden died at East Louisiana State Hospital in Jackson of "arterio sclerosis cerebral" with "chronic alcoholism of several years past" contributing. He had been committed to the hospital in 1907 suffering from what is believed to be schizophrenia. 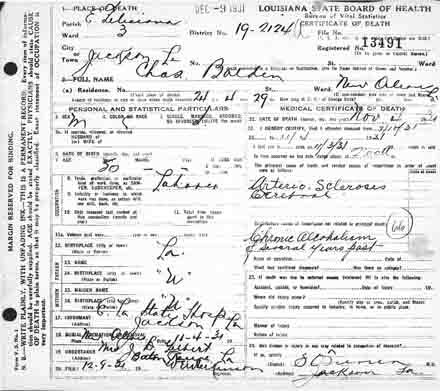 Two copies of Bolden's death certificate were filed, one issued in East Feliciana Parish (Statewide Deaths, 1931, vol. 32, #13491), and one in Orleans Parish where his body was sent for burial (Orleans Deaths, 1931, vol. 202, p. 2638). This month's document is the Statewide certificate. (10/1/16) Born and raised in Mississippi, Eliza Jane Poitevant began submitting her writings to newspapers and magazines after the Civil War, writing under the pseudonym Pearl Rivers. She accepted a job with the New Orleans Picayune and in 1872, married co-owner, Alva Holbrook. He died four years later and left the newspaper to his young widow, who introduced many innovations that made the Picayune one of the leading journals in the South. In 1878, Eliza Jane married George Nicholson, the paper's business manager. She and her husband died in 1896 of influenza, leaving two children. At the time of her death, she was the only woman in the world who owned and personally managed a big metropolitan daily newspaper. 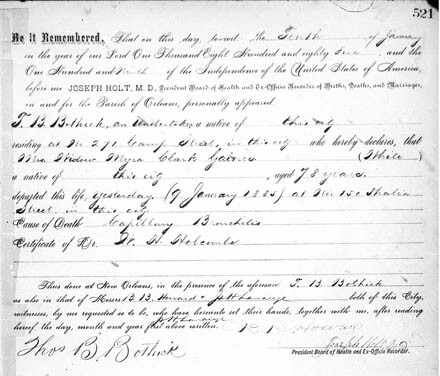 This month's document is her death certificate dated 16 February 1896. 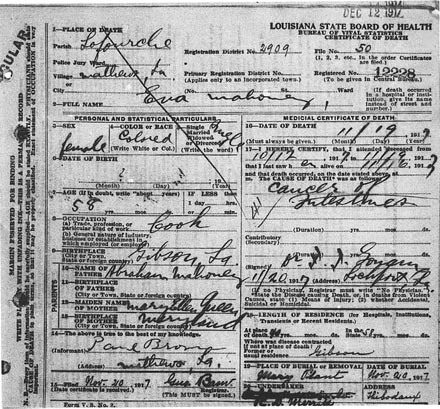 The document can be found at the Louisiana State Archives, Orleans Deaths, 1896, vol. 110, p. 552. (9/1/16) Legendary jazz clarinetist and New Orleans native Pete Fountain was known for his unique style. In the late 1950s, he appeared on The Lawrence Welk Show and appeared many times on The Tonight Show Starring Johnny Carson. He was inducted in the Louisiana Music Hall of Fame in 2007 and the Delta Music Museum in 2008. He died recently in New Orleans at the age of 86. His marriage certificate, featured as this month's document, gives his name as Peter Dewey Fountain, Jr., the son of Peter Dewey Fountain, Sr., and Madeleine A. Letort. He was married in 1951 to Beverly Anne Lang. 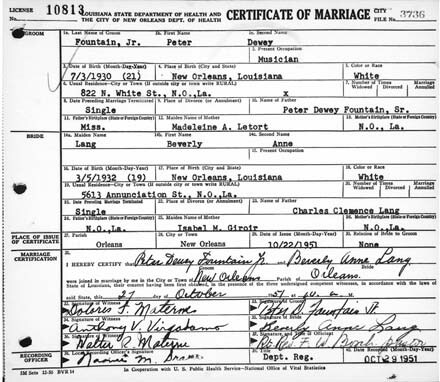 The document can be found at the Louisiana State Archives, Orleans Marriages, 1951, vol. 0, #3736. (8/1/16) In 1838, Georgetown University sold 272 slaves to two plantation owners in Louisiana, Henry Johnson and Jesse Batey. These slaves were placed on three plantations in Iberville, Ascension, and Terrebonne Parishes. In 2015, the Georgetown Memory Project was founded by a Georgetown alumnus to trace the descendants of these slaves. The project, which is ongoing, has identified and traced some 2,000 descendants (living and deceased) to date. 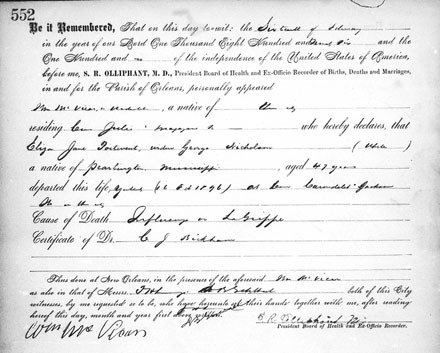 This month's document is the death certificate of the daughter of two of the Georgetown slaves, Abraham Mahoney and Mary Ellen Queen. Eva Mahoney was born around 1856 near Gibson, Louisiana, and died in 1917 in Matthews in Lafourche Parish. The document can be found at the Louisiana State Archives, Statewide Deaths, 1917, vol. 26, #12228. (7/1/16)The assassination of St. Landry Parish Sheriff Marion L. Swords was front-page news in the summer of 1916. The popular sheriff was killed instantly by a bullet from the gun of a fugitive named Hilaire Carriere, whom Swords and his deputy were attempting to arrest in the section of Mallet Woods called Pot Cove. A man hunt ensued and Carriere was shot and captured a few weeks later near Elton. He recovered from his wounds and was tried in St. Landry Parish, found guilty, and sentenced to death. The conviction was appealed, but upheld by the State Supreme Court. Carriere was hanged in Baton Rouge on the 19th of October 1917. This month's document is the death certificate of Marion Lewis Swords. He was born in Big Cane, Louisiana, in 1857, the son of James T. Swords of Georgia and Marry Mass of Louisiana. Under cause of death, it states, "Killed by an outlaw while trying to make the arrest. Died of Gunshot wound through the heart." 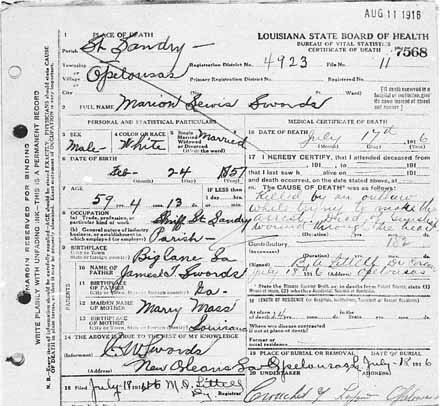 The document can be found at the Louisiana State Archives, Statewide Deaths, 1916, vol. 15, #7568. (6/1/16) In the 1880s and 1890s, the Louisiana State Legislature enacted laws for the relief of Confederate soldiers and their widows. Three of these acts provided land warrants to eligible soldiers who had been wounded, maimed, killed, or contracted diseases while in the service of the Confederate States of America. These acts provided one quarter section (160 acres) of state lands, generally swamp lands, to applicants who could successfully prove their eligibility. In general, an applicant had to provide a certificate from a physician attesting to the extent of his injury or disease, an affidavit from his comrades who had served in the same unit, and the extent to which he was unable to pursue his avocation. If the applicant was the widow, she was required to prove that she had not remarried and was dependent on her own labors for support. Records of these applications and warrants can be found at the Louisiana State Archives on six reels of microfilm called Confederate Land Grant Applications and Warrants: 1884-1886 (Accession No. P1987-150). An index to this collection was compiled by Houston Jenks and published in his book, Confederate Proofs and Land Warrants Issued Pursuant to Act 86 (1884), Act 116 (1886), and Act 55 (1896). 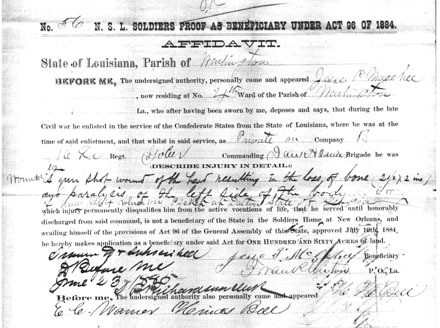 This month's document is one page from the application of Jesse P. McGehee of Washington Parish. His affidavit of 23 June 1885 describes the injury he received doing picket duty at Dalton, Georgia, in May of 1864. Attesting to his claim are his comrades H.H. Bell, E.C. Warner, and Hinds Bell. (4/1/16) Born in Louisiana in 1750, Marie Louise Le S�n�chal d'Auberville was the daughter of a French official. She was married in New Orleans 1770 to Francisco Bouligny, a Spanish officer who had joined Alejandro O'Reilly's Louisiana expedition in Louisiana just one year earlier. Her husband would go on to serve as lieutenant governor of Louisiana in charge of new settlements, commerce, and Native American relations. In 1779, he established New Iberia with immigrants from Malaga, Spain (see the March 2016 issue of Le Raconteur for a related article). Bouligny died in 1800 and Marie Louise would live another 34 years. 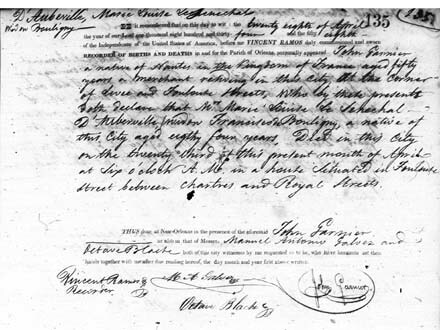 Her New Orleans death certificate featured this month indicates she died at the age of 84 on the 23rd of April 1834 in a house situated on Toulouse Street between Chartres and Royal Streets. It can be found in the Orleans Parish death certificates on file at the Louisiana State Archives (vol. 5, p. 135). (3/1/16) Louis Charles Roudanez was a physician and founder of the first black daily newspaper in the United States. Born in 1823 in St. James Parish to a French merchant and free woman of color, he was raised in New Orleans and studied medicine in Paris. Returning to New Orleans, he opened a medical practice. In the 1860s, he published two newspapers, L'Union in 1862 and The New Orleans Tribune in 1864. He died in New Orleans in 1890. 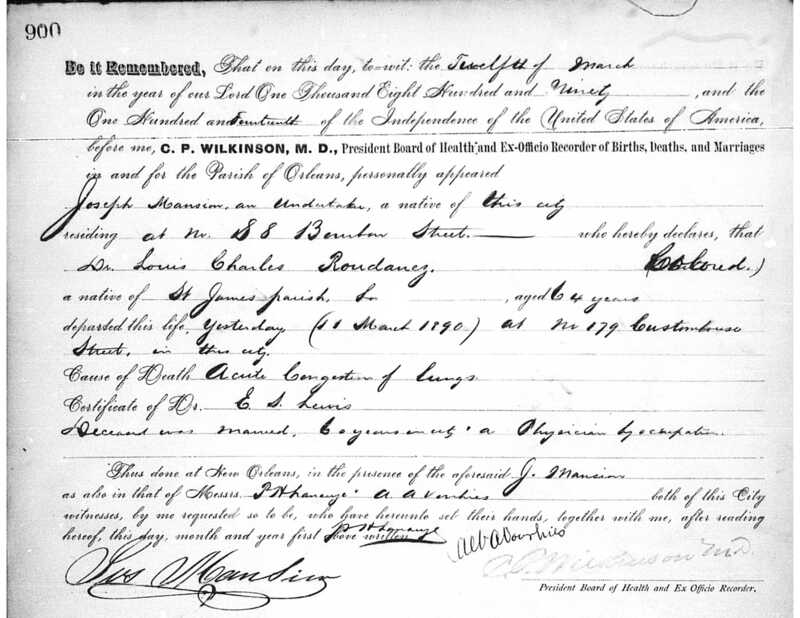 His death certificate featured here gives his cause of death as acute congestion of lungs. 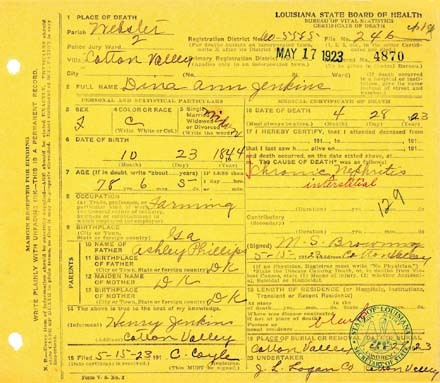 It can be found in the Orleans Parish death certificates on file at the Louisiana State Archives (vol. 96, p. 900). For more information, see The New Orleans Tribune, An Introduction to America's First Black Daily Newspaper, a copy of which can be found at the State Archives. (2/1/16) Homer Plessy was the plaintiff in the landmark U.S. Supreme Court case, Plessy v. Ferguson, which formed the basis of the "Separate but Equal" doctrine of segregation. His death certificate, this month's document, illustrates that even official documents can be wrong. This typed version gives his name as "Owen" Plessy, likely a misreading of the name "Omer," the French version of Homer. It indicates that he was aged 63 and died 1 March 1925 at 2507 St. Philip Street in New Orleans. He was married, a collector, and the son of Adolph Plessy and Rosa Debert. 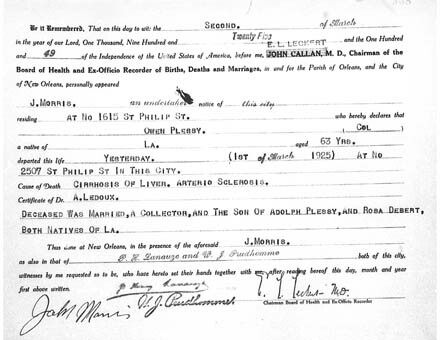 It can be found in the Orleans Parish death certificates on file at the Louisiana State Archives (vol. 190, p. 338). See also the July 2016 Document of the Month for his 1888 marriage certificate. (1/1/16) Myra Clark Gaines' was a popular New Orleans figure of 19th century New Orleans. She is known for having the longest-running lawsuit in the history of the United States court system. For more than a half a century, she fought to be recognized as the sole heir of her deceased father's large estate. She died in New Orleans 9 January 1885 at the age of 78. 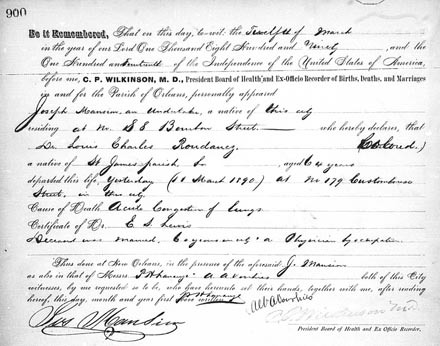 Her death certificate featured here gives her cause of death as "capillary bronchitis." This document can be found among the Orleans Parish death certificates (vol. 86, p. 521) on file at the Louisiana State Archives.